Homepage - Dashly, a smarter way to manage your mortgage. Dashly compares your mortgage every day. So you can enjoy saving forever. Dashly is the UK’s only service that automatically compares your mortgage every day. With savings alerts, crystal-clear data and simple switching, managing your mortgage is effortless. Forever. 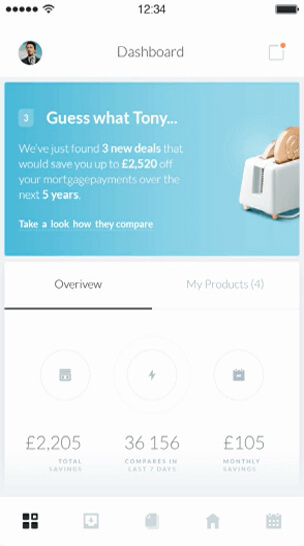 New tool could help cut your mortgage bills by thousands of pounds per year"
"Dashly is not just another new robo-mortgage adviser..."
Dashly scours the entire market every day, tracking hundreds of market factors and testing thousands of lender deals against your mortgage to deliver savings the moment they’re available. So create an account. Scan a couple papers. Have a drink. And forget about us until we find you a personalized deal that makes your mortgage effortless. Millions of calculations. Zero spam. Your personal adviser helps you switch via our app -- you have access to the whole process, the whole time. Make your life easy with a crystal-clear overview of all the numbers that matter. From changing property values to your next payment date, everything is right there on one simple screen. Monitoring your mortgage has never been easier. With Dashly’s beautiful charts, mortgage comparison has never looked so good. Quickly identify how different features stack up and see exactly how much you can save - both month-by-month and across the lifespan of your mortgage agreement. Changing your mortgage used to be a hassle. Dashly lays out your options with total clarity and sends your preferences to our qualified mortgage experts who can take care of everything for you. 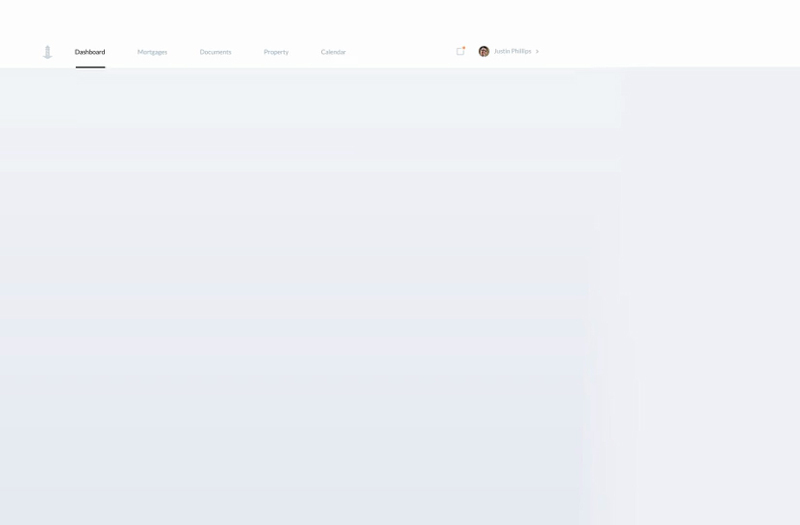 Track your application every step of the way right there in the app. Important paperwork: it’s never there when you need it most. Dashly gives you one convenient place to store your mortgage documents, key dates, policy numbers and contact details. It’s secure, it’s smart and it will never get lost at the back of a drawer. In the know wherever you go With great-looking apps for iOS and Android, it’s easy to manage your mortgage on the move. You used to think mortgages were complicated. Now you have the entire market in the palm of your hand. With great-looking apps for iOS and Android, it’s easy to manage your mortgage on the move. You used to think mortgages were complicated. Now you have the entire market in the palm of your hand. Dashly never uses hidden charges, aggravating advertisements, or crazed email campaigns to make money. Just unbiased value for our human friends. Our expert team gets paid out of mortgage provider fees, keeping our promise of keeping out of your pocket. Our security rivals the world’s leading banks -- your mortgage is safe with us. We’re authorised and regulated by the Financial Conduct Authority. "I know I’m on the best mortgage rate already." The mortgage market changes fast. Sticking with the same mortgage for years on end often results in paying over the odds. Set up Dashly once, conquer your mortgage forever. Own a property? You need Dashly. Getting started is as simple as answering ten easy questions. You can be up and running within ten minutes! Alternatively upload photos of your paperwork and we can set up your account for you. What are you waiting for?